October holidays mean creative fun and getting your hands dirty! This is an opportunity for children, young people and adults to experience clay work and casting in plaster. Children 12 to 18 can attend unaccompanied, while children from 6 to 11 need to attend along with an adult over 18. This could be a parent, carer, or friend and will lead to brilliant joint working. Children will relish creative freedom while learning new things. 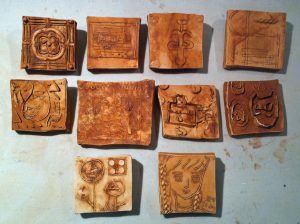 Adults will not only produce lovely work themselves, but also learn clay and plaster techniques which they can explore further with children at a later stage. In the workshop you will roll out a slab of clay and then use tools and materials provided such as cord, leaves and lace to press into the damp clay, making lines and textures. All of the materials are removed leaving an impression in the clay, and you then build strong clay walls around your work and pour liquid plaster on top. In about fifteen minutes the plaster will set like stone and you are left with a permanent cast! You will be amazed at the results. All materials are provided, along with tea, coffee, juice and snacks. Cost £10 per child and £10 per adult for a two-hour session. Maximum group size 10.